BLUEGRASS HAWAI`I is a traditional and bluegrass music society dedicated to connecting fans and musicians all over the Hawaiian Islands, and supporting events and concerts that help promote and perpetuate bluegrass and traditional music! On behalf of the Bluegrass Hawai'i community, I'd like to welcome you to bluegrasshawaii.com! 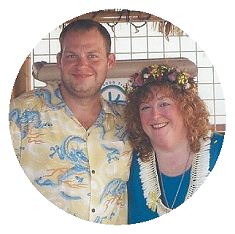 My name is Caroline Wright, and I'm the founder and president emeritus of Bluegrass Hawai'i. You may be wondering how bluegrass & traditional music could have found a place to grow and flourish all the way out here in the middle of the Pacific. Well, my late mom and step-dad were two of the founding members of the Adirondack Bluegrass League in upstate New York, launched in 1972, so the music is in my blood! I'm also a bluegrass music journalist, co-author of Still Inside, the authorized biography of flatpicking guitar pioneer Tony Rice with Tim Stafford from Blue Highway, and former editor of the now-defunct magazine Bluegrass Now. You'll probably see me at jams and events with my husband, Matt Campbell--that's us over there on the right. Please feel free to come up and say howdy if you see us! 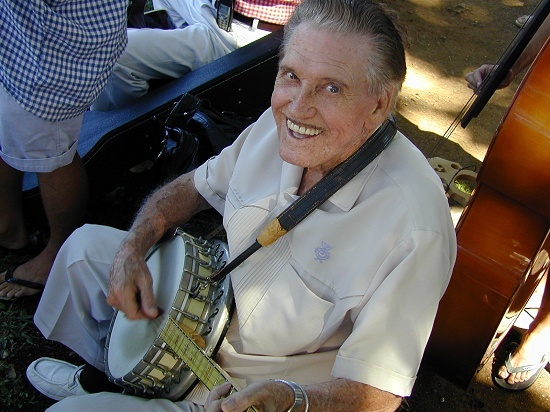 I lived on O'ahu from 1990-1997, and during that time, I met perhaps a dozen bluegrass musicians. After a four-year absence, I returned to the islands in 2001, and began wondering what had happened to all those pickers. Surely there could be more I didn't know about! I decided to test the waters with an open, free jam session at Thomas Square, a lovely park in the heart of Honolulu. You might be surprised to learn that there are jams and singing events on O`ahu, Maui, the Big Island of Hawai'i and Kauai. Bluegrass is growing strong in Hawai'i! We are now an official 501(c)(3) non-profit organization and a proud member association of the International Bluegrass Music Association (IBMA). We offer paid memberships ($10 per person per year) and there are almost 750 people on our mailing list! Please come and join us at one of our events and jams... and don't forget to come up and say HOWDY! A number of O`ahu pickers and grinners have made significant contributions in time, effort, enthusiasm, and music to Bluegrass Hawai`i, which could not exist without them. Mahalo nui loa to Rene & Teresa Berthiaume, Paul Sato, Angelika & Joel Veach, Doug Toews, Lisa Gomes, Kilin Reece, Lesley Kline, Alex Morrison, Gordon Freitas, Sam Hayakawa, Chris & Carmen Cerna, George Massengale, Neal & Jan Snyder, Bob & Mary Schornstheimer, and Bob Schacht. Special thanks to Matt Campbell and the rest of Caroline's family for graciously supporting her bluegrass habit! Our friend Mike Kear in Australia has generously provided us with server space for Bluegrass Hawai`i. Mahalo nui loa, Mike! Mike is the host of a wonderful radio show, heard on the Web by thousands of people all over the world, called Music From Foggy Hollow. It can be heard at http://www.bluegrasscountry.org/. He even interviewed Caroline (that's me!) about Bluegrass Hawai`i, way back in May 2003 when we had our first jam--check it out here. 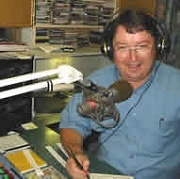 Mike's Bluegrass Australia pages can be found at http://www.bluegrass.org.au/. Mike hosts this website on his servers and has provided endless encouragement and support for our adventures. On behalf of Bluegrass Hawai`i, THANKS, MIKE! Please bookmark this page and come to the next jam if you can. Better still, add yourself to our mailing list! Click here. Over three dozen musicians brought banjos, fiddles, mandolins, guitars, resophonic guitars and upright basses to the all-acoustic jam session. The "pickers" took turns improvising breaks on instrumentals such as "Salt Creek", "Foggy Mountain Breakdown" and "Jerusalem Ridge", and harmonizing on tunes like "Angel Band", "Paradise", and "Roll In My Sweet Baby's Arms." Two bluegrass bands on O`ahu, the Down Boys and the Wild Orchids String Band, contributed their talents to Sunday's jam session. Musicians from local traditional jam, contra dance, and hootenanny groups also played at the event. Since then, we've had plenty more jams, each more wonderful than the last! Check here for the next one! Questions or comments? Email caroline@bluegrasshawaii.com.